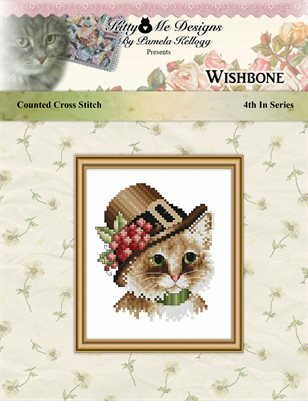 4th in the series of Cats In Seasonal Hats, this is Wishbone. He's dressed like a pilgrim for Thanksgiving!! The stitch count for this design is 53 stitch wide X 60 stitches high. On 28 count Evenweave over 2 fabric threads or 14 count Aida, the stitched area will be 3 3/4 inches wide X 4 1/4 inches high. DMC Embroidery Floss and 1 spool of Kreinik Metallic Braid.